Are you tired of wasting money on ads and strategies that show little or no return? Self-Propelled Marketing may be just what you need to get media exposure on a small budget. Hank doesn’t say this lightly. As a PR/Marketing professional, he’d be more than happy to do it all for you. In fact, that’s exactly how he earns his living each day, overseeing marketing and advertising campaigns for his clients. And each day he hears the same story from small businesses who have invested thousands of dollars with PR, marketing, or advertising companies that delivered little more than a business owner might achieve with a bit of knowledge about where to begin. Self-Propelled Marketing gives you the knowledge you need to take control of your business marketing. Writing press releases: Learn what the pros know for writing press releases that will get you and your events noticed. This six-lesson section takes you through the steps of press release writing and distribution. Media contacts: Getting to know the faces and names of the folks who make the news is the first step. Learn the art of developing media contacts. Your website: Your business needs a website. This section shows you how to secure a domain name, choose a web host to house your site, and more. Compare popular web-building platforms, and gain some insights about Search Engine Optimization (SEO). Paid advertising: When should you use paid ads? The course looks at local special advertising sections and gives great tips about online advertising, Facebook, and Instagram ads. Don’t delay. 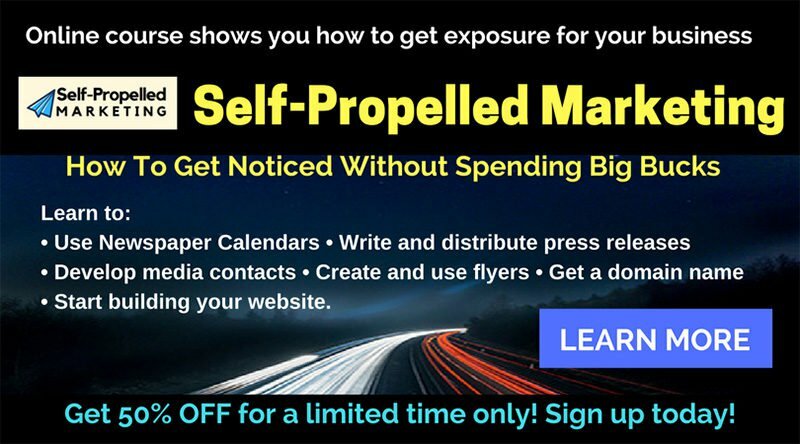 Get Self-Propelled Marketing today. Grab it for 50% OFF during their Launch Special, for a limited time only.